There’s a list out there somewhere of the most extreme things in the Universe. Blazars must certainly be on that list. Astronomers used to think that blazars were variable stars, but strangely, they didn’t change in brightness in any predictable way. But then in the 1970s astronomers realized that these objects were actually millions of light-years away. They were outside our galaxy, and yet they were so bright they outshone all the rest of the stars in their galaxy. So what is a blazar? Simply put, it’s the core of an active galaxy, where the galaxy is oriented face on, so a relativistic jet blasting out of the galaxy is oriented directly towards the Earth. All large galaxies seem to contain supermassive black holes. There are times when these black holes are actively feeding on infalling material. In fact, so much material tries to get into the black hole that it backs up into an accretion disk around the center of the galaxy. The gravitational pressure is so extreme that the material heats up to millions of degrees and becomes like a star, emitting a tremendous amount of radiation. The rapidly spinning black hole generates a powerful magnetic field that whips up the material into jets that blast above and below the black hole. Material caught in these jets is accelerated nearly to the speed of light and fired out for hundreds of thousands of light-years. 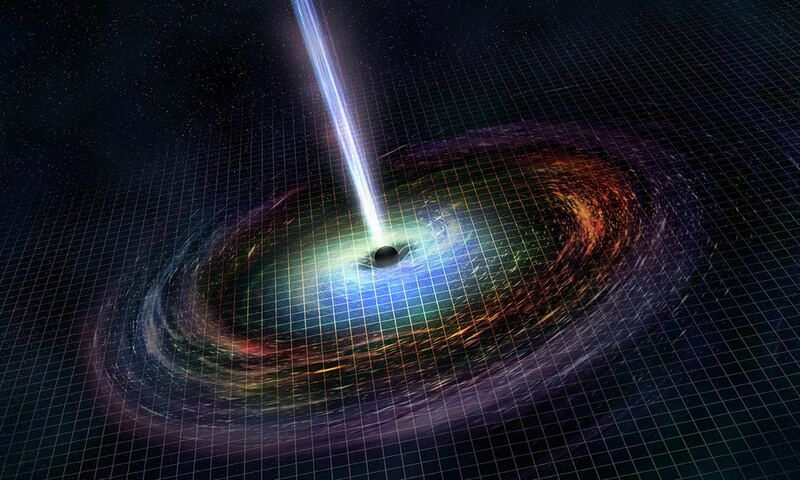 When we see a blazar, we’re looking at an actively feeding galaxy face on. Furthermore, one of the relativistic jets is oriented so that it’s pointed directly towards us, and we can see the radiation emitted by both the black hole and the jet. Even though these blazars can be as far as 9 billion light-years away, they’re still detectable by Earth-based instruments. Now that’s bright. We have written many articles about galaxies for Universe Today. Here’s an article about a recent blazar observation.